The scene has shifted at Westminster. Europe has granted the UK an extension on our membership of the EU until October 31st, almost certainly obliging us to take part in the European elections on May 23rd. While the government will be playing that down as an inconvenience, others are seeing it as a moment of possibly historic change. This is partly because the European elections are proportional, allowing a much clearer sense of where voters’ loyalties are in the Brexit debate than any general election would. With at least five parties – Green, Lib Dem, SNP, Plaid Cymru and the new Change UK campaigning openly for a People’s Vote in the hope of a Remain result, this could easily act as a ‘soft referendum’. The newly formed Brexit Party and UKIP would occupy the Leave corner. But it will be interesting to see how the two major parties – Labour and Conservative – cope at the hustings, when both have had to bridge the divide in their parties since 2016. But there’s much more on offer than European preferences. While over 90 new parties have been registered since the referendum in 2016 at least two – Change.UK and Brexit Party – claim to be standing explicitly for deeper political reform. I say ‘claim to be’ because what that means is anyone’s guess – neither have a manifesto or programme that does more than call for “an alternative”. If they stand in May, it will be in the familiar way, with citizens enlisted as either voters, or as footsoldiers executing a campaigning strategy. No promises of new democratic processes or structures – the kinds we explore here regularly - are mentioned so far. While the Green Party and Lib Dems always do better in European elections because they are proportional, this will be the first test of how much the two main parties lose to the new ones. If this happens, then both the Tories and Labour will have to consider moving towards coalitions for a General Election. And for some of those smaller parties, moving to a proportional system may be the price of cooperating with the bigger parties. If that happens, watch out for some genuinely alternative parties on the menu. And if you find that hard to imagine, remember how Alternativet in Denmark crowd-sourced their first political programme. Or how Taiwan underwent a political revolution almost overnight by adopting digital democracy. This next month will be crucial for setting the scene. From our point of view in The Alternative UK, the story needs to shift urgently from the battle of Brexit personalities to the demands of our dying planet. Can the call for a new politics be framed as a necessity for our survival? 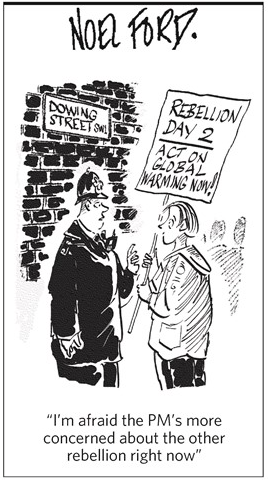 In a serendipitous moment, this week will see a massive disruption of the capital’s busiest roads as Extinction Rebellion attempts to seize the media narrative for climate catastrophe. Thousands of citizens around the country have been in preparation for weeks, rehearsing how to ground London to a halt. Following the Rebellion Day on November 17th - which saw citizens chain themselves to bridges - their tactic of deliberately provoking mass arrests to gain media attention to the movement has grown, becoming an International Rebellion. This week similar actions will take place in 27 other countries including Ireland, Australia, Canada, France, Sweden, Germany, Colombia, New Zealand and in New York City for a national day of action for the United States. XR’s demand is above all for the government to tell the truth about the dangerous climatic state we are in and radically change its environmental policy. Since the IPPC’s report, which clearly stated that we have what is now an eleven-year window to save the planet, there has been zero response from Westminster. However, in that same period, a number of cities, towns and councils have declared a climate emergency unilaterally (see the list here). This is the real hope of media disruption – that regular citizens, already disillusioned with Brexit shenanigans, begin to think about not only new politics but new agendas too. In that space of possibility, XR is also doing what it can to call for and model a different political structure and behaviour. They demand to create and be led by a Citizens’ Assembly on climate and ecological justice; whenever they meet, they try to set up People’s Assemblies. While disruptive, the demonstration is explicitly non-violent, with organisers all over the country offering non-violent-direct-action training (NVDA). Within the meetings, the attention paid to diversity, culture, and emotional as well as physical needs, puts the participating citizen at the centre of the action. In direct contrast to the leading from the front style of political parties, or indeed armies, XR are encouraged to be self-leaders – responsible for their own well-being but also, for that of others. Taking care of the self sits right next to taking care of each other. If one person gets arrested, s/he knows how to manage the situation. Others are sure to know where they are taken and when they will be released after a night’s detention so that they have immediate support on hand. Because this is a new peoples’ movement, there is very little literature to abide by. Also, the diversity of those rising to the call is probably unprecedented – with no class, colour or skills basis to make those taking part cohere in an obvious way. These challenges are very similar to those of the new politics: how to bring people previously excluded from the conversation around power into a trusting relationship with each other? Speaking at length to Annabelle Macfadyen, one of the convenors of XR Frome, I can sense the care taken to carefully hold the group together. While the main body came into agreement quite easily about how to present and conduct themselves on the streets of London, there were a number of tensions in the group that, if left unattended, could disrupt them from within. Some of these are not dissimilar to those described in our recent editorial on ‘new democracy practices’. For example, the tension between those who want to pay attention to the needs of individuals in the moment and those who just want to get on with planning and executing. Annabelle’s training - helping people face their fears and embody their own power and influence over a situation erupting around them - will be invaluable on the streets. But the challenges they’ll face are hard to imagine in advance. Another familiar challenge is the demand for expert input: for example, ‘if we just follow the recommendations of this or that book, we don’t have to waste our time looking for the answer.’ No doubt, all of the expertise available will come in useful somewhere on the journey. However, there is some earlier work to be done. People need to primally reconnect with their own capacities both for assessing a situation, and developing their own sense of agency. This stage cannot be skipped, if the changes we are looking for are to be sustainable. And then there is the challenge of individual and group identity. The XR group in Frome are an arty bunch, but not everyone feels comfortable in full play mode on the streets of London. Being able to hold both large and small differences, rather than dismiss them in any way, is key to the success and longevity of this new way of being political. Where rules are laid down or ideology is used to shame people into falling into line, factions arise. The great capacity that Annabelle models - welcoming all challenges and difference into the space, while moving steadily into the scene of action - is core to the success of Extinction Rebellion. Paying attention to not only the needs of individuals, but also their distinct identities and creative capacities, is also the development that we in A/UK are looking for in a new politics. Without that attention to people, in their communities, any fix from the top down will simply leave the seeds of further conflict to flourish again in the future.